Cycling is probably the best and easiest way to discover the local area. 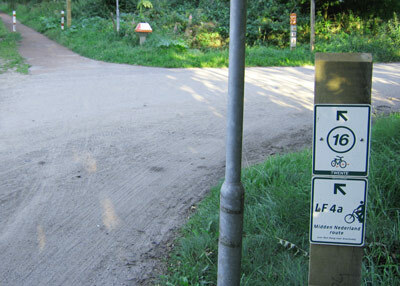 Holland has a large network of biking routes and Enschede is included in some long distance routes like LF4 (Midden-Nederlandroute) and LF14 (Saksenroute). For those wo prefer to stay more close to the city there are routes like the Eschmarke route that takes you in a big circle aroud the city. Another great way to explore the landscape is the 'fiets knooppunten netwerk', a large network of numbered intersections. Following the numbers you just bike from one crossing to another in a flexible way. Parts of this network overlaps the LF routes. Cycling through Twente you will see the diverse agriculture and woodlands that can be found in the mixed up Twente surroundings. It is possible to hire bikes at the trainstation, where you can also start one of the tours. Clear signage along the cycling routes. When you like bike across the border aswell you can use the German online routeplanner for bikes. Many interesting routes are included but you can play your own route aswell.